Briefly: Kant's Groundwork of the Metaphysics of Morals is a summarized version of Immanual Kant's original treatsie, which is designed to assist university and sixth-form students in acquiring knowledge and understanding of this key text. Based on, and page referenced to, Mary Gregor's edition of the Groundwork, CUP an important feature of the book is its close adherence to Kant's text, enabling the reader to follow each development in the argument as it occurs. It will be of particular value in helping students to revise for university examinations in Philosophy and Theology and for A-level examinations in Religious Studies. 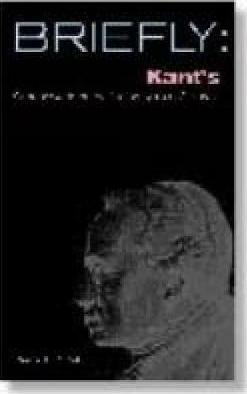 The introduction contains a brief biography of Kant, examines and assesses the importance of the main issues covered by his Groundwork, and indicates where they are to be found in the text. There is a comprehensive glossary of terms.